What's Best, a Mare, Gelding or Stallion? Should a Beginner Rider Buy a Stallion, Gelding or Mare? When you are looking for your first horse, you might wonder, should you buy a gelding, a stallion, or a mare? When starting out, you want to choose a horse with a reliable temperament; hormones like testosterone are highly linked to aggression, which is why most beginner riders are advised to steer clear of stallions. Mares and geldings are usually calmer, but there are always exceptions. 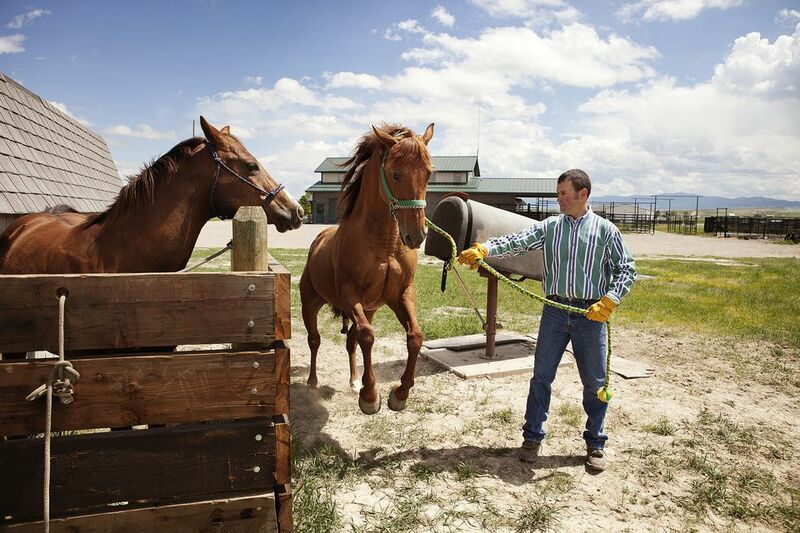 Here are some things to take into account when choosing which type of horse is right for you. In general, stallions don't make good beginner horses. High-end riding stables might put a beginner on a stallion under close supervision. Stallions can be too self-interested and can become hazardous in the hands of someone who doesn’t understand how to handle them. For most riders or owners just starting out on their own, buying a stallion could be a disastrous move, even if the idea of owning a stallion seems romantic. Some experienced riders and owners refuse to have a stallion because even the most well-behaved, well-trained ones can become temperamental and, without proper handling, dangerous. While mares are less aggressive than stallions, they can have their difficult moments as well. During their heat cycles, mares can sometimes get "moody" or temperamental. This may be most obvious in the spring, during the natural breeding season. During this time, some mares are very “hormonal” and will have their minds on something other than their rider or handler. Mares can cycle at any time of year, and the accompanying moodiness may also appear to a greater or lesser degree. Not all mares are difficult to handle during this time. A lot will depend on their training and basic temperament. If a once well-behaved mare becomes unusually moody, she may be suffering from cystic ovaries, or other health issues, which require the attention of a veterinarian. Moodiness aside, many mares make great beginner horses. Although their heat cycles can be inconvenient, it’s rarely dangerous, especially if there is no stallion around. For a beginner rider, there is a slight bias in favor of geldings. The reason for this is that geldings tend to have fewer mood swings than mares because they have no heat cycles. Depending on the horse’s training, temperament, and how late in life the horse was gelded, a gelding may or may not be the best choice. Geldings gelded late in life may still retain some of the behavioral characteristics of a stallion, although they are physically unable to reproduce. These horses are not a good choice for a beginner. A horse that was gelded early in its life will likely be the steadiest. When choosing a gelding, there is one thing a buyer has to watch for, and that’s a ridgling. If a horse is stallion-like in its behavior but appears to be a gelding, it may be something called a ​rig, or ridgling. Before modern veterinarian medicine ensured gelding was done properly, a horse left with some testicular and epididymis tissue may have exhibited stallion-like behavior. This is where the term ‘proud cut’ comes from. Today, it’s unlikely you will find any truly ‘proud cut’ geldings. They are more likely to be cryptorchids. This is a procedure that renders the stallion unable to reproduce while still producing testosterone, a hormone which makes stallions more aggressive. What Age Should Your First Horse Be?